Over a 3-year period, 42 patients underwent radical laryngectomy and bilateral neck levels 4 and 5 nodal dissection with the insertion of a Provox® VRD post radiotherapy. Three patients developed an expanding TEP that was recalcitrant to non-surgical conservative management, two of whom failed free flap surgery. Their final repair was a PMMF as described below. The tracheostome was intubated with an armored tracheal tube (Figure 1a). 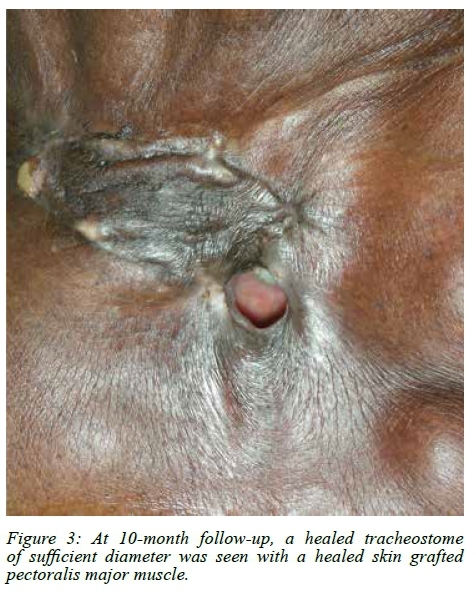 The stoma was surgically increased in size by tissue excision to gain access to the TEP positioned on the back wall of the trachea at the level of the thoracic inlet. 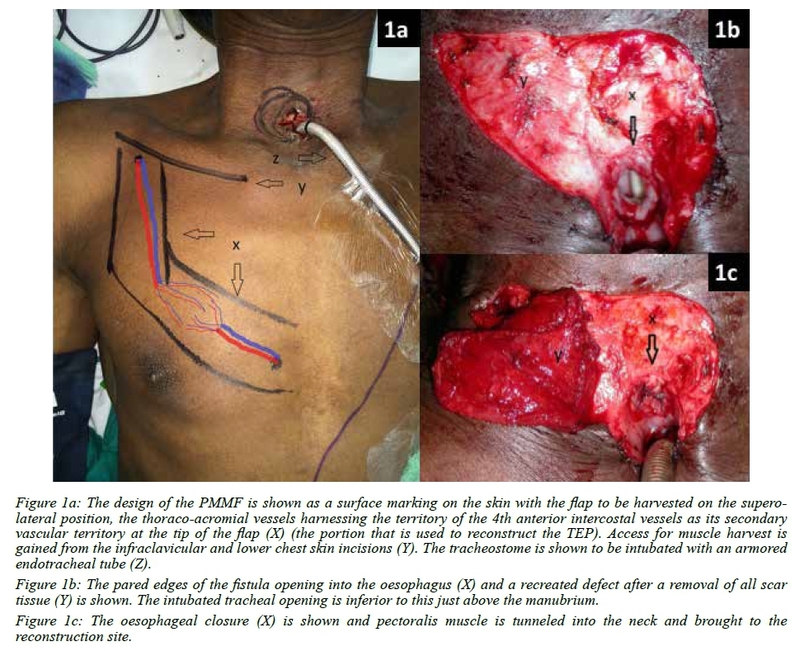 Muscle was harvested taking the form of a narrow band over the territories of the thoracoacromial vessels and the 4th perforating vessels of the internal thoracic (Figure 1a demonstrates the incisions and the blood supply). Scarred soft tissues above, lateral and below the TEP were removed creating a wound bed for the on-lay muscle flap (Figure 1b). The oesophageal mucosa was pared in preparation for closure (Figure 1b). The pectoralis major flap harvest pattern was marked on the skin surface of the chest (Figure 1a). The flap was supplied by the thoracoacromial vessels only, relying on the vascular connections to the 4th perforator vessels in supplying the narrow tip of the flap that was used for the TEP repair. 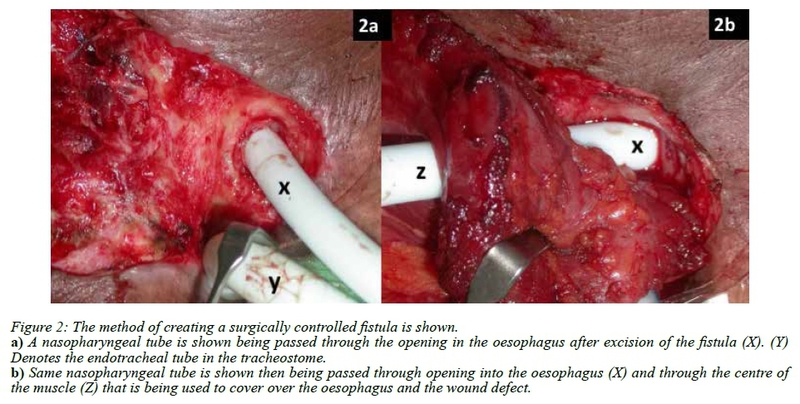 Following the direct closure of the oesophageal defect the pectoralis muscle was tunneled subcutaneously to cover the created soft tissue wound, the repaired oesophagus and the created tracheal mucosal defect (Figure 1c). If access for suturing was limited then the tip of the flap was parachuted down through the stoma once all the individual sutures were placed. When there were poor quality tissues and patients had a persistent cough, the oesophageal opening was stented with an appropriate size tube which was then exteriorised through the core of the muscle (Figures 2a and b). This step created a surgically controlled fistula as part of the repair process. The introduction of the hollow stent allowed for the decompression of the pharynx and oesophagus to prevent a blowout of the repair with coughing. The stent serves to drain the saliva preventing accumulation and the risk of infection whilst the flap beds in. The exposed muscle flap was then skin grafted. The trachea was kept initially intubated with a reinforced endotracheal tube bent over the sternum to avoid pressure on the flap. Once the flap swelling dissipated the endotracheal tube was changed to a portex tube. The oesophageal stent was removed at the same time. This occurred approximately on day10 once flap healing was noted. No significant leak was observed after removal of the stent and the surgically created fistula which had not epithelialised rapidly went on to heal spontaneously. Oral ingestion was commenced after 3 weeks. The portex tube was removed from the tracheal stoma at 6 weeks once it had matured. The flap of choice for the on-lay closure was the fasciocutaneous free radial forearm flap. Two days postoperatively the patient was suspected to have a high output chylous fluid leak. The ensuing neck exploration was negative. A massive bleed occurred during exploration. There was accidental irreparable damage to the pedicle of the flap and the flap was discarded. One week later, a second on-lay repair of the defect was performed with a PMMF. Healing was uncomplicated. A free brachioradialis muscle flap was performed for the onlay reconstruction. In the postoperative period, the patient had incessant coughing. On day 2, salivary leakage into the neck from an oesophageal closure breakdown compromised the blood supply to the free flap that on exploration could not be restored. The reconstruction was immediately redone with a free lateral arm flap with a small composite triceps muscle component. Tisseel™ fibrin glue was used to bolster suture line. Despite several flap protective adjuncts, it became irreversibly ischemic by day 7. At reoperation the flap was removed and a pectoralis major flap was used. The repair was stented as shown in Figures 2a and b. This we feel was the critical step in making this reconstruction a success. At 10 months follow-up the patient had an adequate tracheostome and a healed TEP repair. A PMMF was used primarily for the on-lay repair avoiding free tissue transfer and inherent risks. Healing was uneventful. Figure 3 shows the postoperative result at 10 months follow-up. In this cohort the expanding TEP rate was 7% (3/42 patients) for the 3-year period of the study. Three free flap failures occurred in 2 patients. PMMF salvaged both patients and was used successfully in a third as the primary procedure. All patients returned to a normal diet and none demonstrated tracheostomal stenosis on long-term follow-up. Gastrograffin swallows performed in 2 of the patients demonstrated no leaks or oesophageal stenosis. Spontaneous closure by removal of the prosthesis may occur. If not, surgical repair is the only form of salvage. This is a challenge against the background of previous management by neck node dissection and radiotherapy. The principles of repair are to isolate the TEP tract, separate the walls of the trachea from the oesophagus and suture close the pared defects of each visceral wall. This should then be followed by importing good quality vascularised tissue to improve the healing potential by interposing a free or a pedicled flap between them.4,5 To perform an interposing flap, resecting the superior portion of the manubrium may be necessary. This carries an inherent risk of mediastinitis in the event of a leak at the repair site. Our initial surgical objective was to use a free flap to provide an on-lay second layer closure for an oesophageal repair performed via the tracheostome. Free flaps do provide vital thin pliable options, because bulk can result in obstruction to the oesophagus, tracheostome or both. However, in this series free flaps failed. This forced us to question their use as the flap of first choice, or as a salvage option for prior failed free flap. By default, PMMF was then used to salvage the reconstruction after 3 free flap failures in the first 2 cases and in the last case the PMMF was used as a primary option of reconstruction. The PMMF is workhorse loco-regional flap for head and neck reconstruction. It is an excellent choice for reliability and vascularity, but it is bulky for use in reconstructing an expanding TEP. Modifications in the harvest technique to reduce its bulk were necessary to make it suitable for closure of a TEP and for maintaining the patency of the tracheostome. The concept of creating a controlled surgical fistula for oesophageal drainage in TEP repair has not been reported before. The purpose was to decompress the oesophagus with a view to preventing a blow-out of the repair that may result from coughing and swallowing. The need for this strategy is best determined by the surgical conditions and patient factors. When using a free flap, risk to blood supply of the flap can result from a failed defect repair and salivary leak. When using the PMMF, blood supply is not exposed to the same risk because the flap transposition and turnover by design brings the thoracoacromial vessels to lie on the external surface of the flap. In the quest for a small thin flap, the narrow strip of muscle lying directly over its blood supply by design also proved to be reliable. A small piece of muscle minimises the risk of tracheostomal stenosis with healing. In the absence of good quality local tissue, the modified PMMF became our first choice. Management of an expanding TEP is a challenge. A narrow PMMF with the option of using a hollow stent for the repair is potentially a good choice in the setting of a previous neck dissection and radiotherapy. The authors have no financial disclosures and report no conflicts of interest with any of the companies or products mentioned in this article. Both authors contributed equally to the study and ethical approval number BCA083/12 was obtained from university's Biomedical Research Ethics committee.